“Make a bridge hand,” he orders. “Get your elbow flat on the table.” I hastily comply. He nods. “That’s better.” Seamus Brereton has been playing snooker competitively since the age of sixteen. In his day, he represented Ireland and got to know many of the sport’s biggest names. Gone perhaps, but not forgotten. When snooker legend Jimmy White visits Ireland, Seamus still acts as his driver, practice partner and unofficial minder. “When Jimmy comes to Ireland, he likes to have the crack. He enjoys himself. But Alex… Alex was crazy.” Brereton recalls a night in 1982 when Alex Higgins, World Snooker Champion at the time, was paid £3,000 to play an exhibition game in Edenderry. At the airport, Higgins demanded his fee upfront and gambled the entire amount away en route in a bookies in Clane. The walls in his snooker room at home are decked out with souvenirs from his playing days. He draws my attention to the felt on the table though. “See this?” he says. “I put it down last October, but it might as well be brand new.” He shakes his head sadly. In the old days, Seamus and his friend, the late Peter McNally, would play for up to twelve hours a day. These days, with family commitments, he doesn’t play nearly as much as he would like to. Friends drop by occasionally for a game. But after a couple of hours they’ll want to go to the pub or go home. •	The 2008 World Snooker Championship begins today in Crucible Theatre in Sheffield. •	The term ‘snooker’ originally derived from a slang term used in the British army to describe a “young, inexperienced cadet”. •	The first World Snooker Championship took place in 1927. But it wasn’t until the BBC started broadcasting the sport in 1969, as a showcase for colour television, that its popularity really took off. •	The first maximum break of 147 point recorded at the World Snooker Championships was by Canadian Cliff Thorburn in 1983. It took him almost eleven minutes to clear the table. •	Fifteen years later, Ronnie O’Sullivan accomplished the same feat in just 5 minutes 20 seconds. •	The ban on tobacco sponsorship in recent years has been a blow to the sport, but it continues to gain in popularity in China and the Far East. He set the bar pretty high for crazy people called Alex. A lot to live up to there. 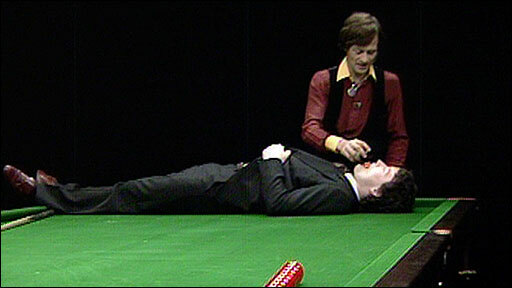 My mate once played a game of pool with Alex Higgins for twenty quid. He lost. @ Sean – So did someone I know, altho I think it was a tenner. It was about ten years ago. Thought it was a great story at the time. Now realise it was rather sad. I remember seeing Alex Higgins do an exhibition in Kells towards the end of his career. It was ghoulish stuff.